In the late summer, I began watching my Mississauga garden for ripening tomatoes. There were lots of fruit on the plants, but they were all green. It was a little disappointing because I love red tomatoes, in every imaginable form. 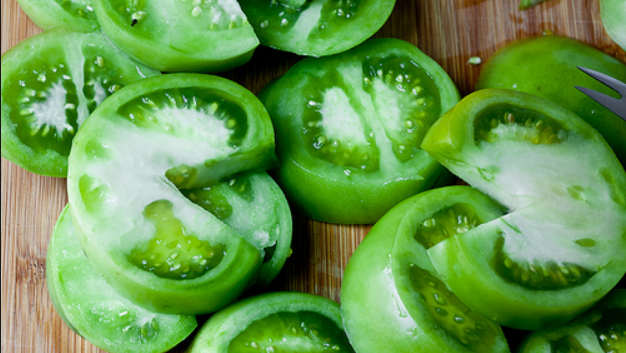 Green tomatoes have never held the same appeal. But then, I’ve never been encouraged to try one. 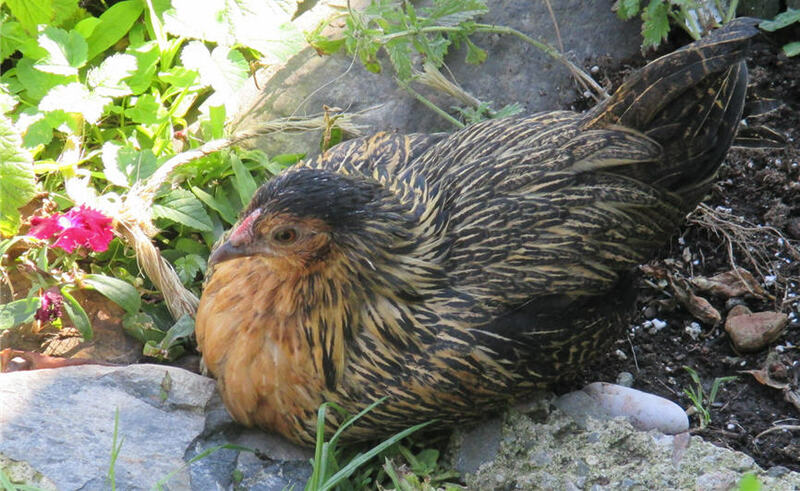 When I left Mississauga for Pouch Cove in late September, I introduced the house family to my plants and the many large green tomatoes, and felt cheated: those plants hadn’t ripened even one tomato for my benefit. In Pouch Cove, I wandered through the garden and was delighted to see several tomato plants, full of large green tomatoes. I was content, for about two weeks. Last week, when Elke announced that we were going to a neighbour’s home for a community potluck Thanksgiving dinner, she suggested to me and Thomas that we think of something from our little garden that we could bring as our contribution. Since I’d been secretly lusting after Elke’s tomatoes, I suggested trying to make something with that harvest. Elke sighed. “The tomatoes didn’t ripen this year,” she told us a little sadly. “I just picked a big bowl of them, and they’re all green. I think it was the weather this year.” With that, she turned to do a few things in the kitchen and left me to ponder. Through my life runs a series of disappointments. Years ago I determined not to give into the obvious response, and instead always saw them as unexpected opportunities, only packaged as a disappointment. Here was another little one. Online, I found a recipe for Fried Green Tomatoes. Lots of people eat those, so I reckoned they’d have to have some appeal. Checking with Elke, I discovered we had all the ingredients needed. She agreed to give me as many tomatoes as I wanted, because she couldn’t imagine another plan besides leaving them on a windowsill to ripen, and she’d already given into despair. Yesterday afternoon, three hours before our dinner was scheduled to begin, I pulled out the recipe. Elke and Thomas graciously disappeared to the barn to give me space. From Elke’s bowl of tomatoes, I pulled anything that looked reasonable. “Slice the tomatoes into half inch slices” the recipe suggested, so I needed fat tomatoes, not misshapen or skinny ones. The harvest had given an abundance of fat green ones, so I was in luck. Then, I lined up three bowls: one had flour and cajun seasoning (which I made by combining a series of spices from Elke’s stores), one had eggs and buttermilk, and the last one had a combination of dried bread crumbs (from Thomas’s earlier homemade loaf, no less!) and corn meal. The recipe was simple and the tomatoes looked pretty lined up for dipping, then dipped, then frying. Because my hands were also being dipped and coated, I couldn’t use the camera, so I took some shots from other sites on the web. Yes, they really do look this good! Tentatively, I took a plate of two cooked tomatoes to the barn. Thomas hesitated because his hands were dirty, so I gently fed my friend my experiment, and at once his face lit up and he gave it an enthusiastic thumbs up. Of course, Thomas is a very encouraging sort, so I still worried. I shouldn’t have. Elke too was enthusiastic. 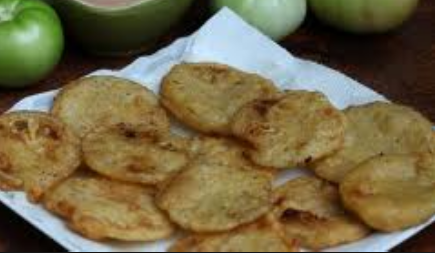 Walking to our neighbour’s home at five p.m., I carried my large glass plate of fried green tomatoes, a double batch of the recipe. People gathered to see the contribution, because while we’d all heard of this treat, no one at the table had ever tried it before. We were all guinea pigs. Everyone took at least one on their plate and the verdict was unanimous: we all loved them! I came home with just two fried green tomatoes, and those only left over because there was so much food on our bountiful table. Fried green tomatoes are almost as good eating as a ripe, red tomato. Almost. And you might not believe this, but they`re awfully good cold, for breakfast. 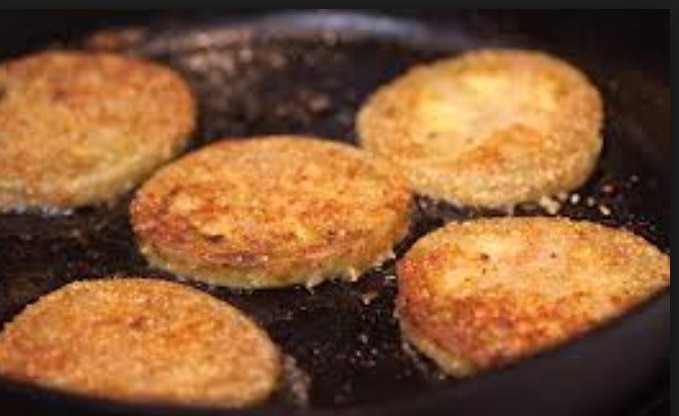 I`m eating my last two fried green tomatoes as I write. Life is full of opportunities. Cut unpeeled tomatoes into 1/2 inch slices. Sprinkle slices with salt. Let tomato slices stand for 5 minutes. Meanwhile, place in separate shallow bowls: the flour and cajun seasoning, buttermilk and egg, and bread crumbs and cornmeal. Heat the oil in a skillet on medium heat. Beat the egg and the buttermilk together. Dip tomato slices in the flour-seasoning mix, then buttermilk-egg mixture, then the cornmeal-bread crumb mix. In the skillet, fry half of the coated tomato slices at a time, for 3-5 minutes on each side or until brown. Set the cooked tomatoes on paper towels to drain. These are fantastic with a little Tabasco sauce or remoulade.